The Northstar area offers a selection of properties to suit various lifestyles and needs. Ranging from Custom Homes to Village Condos, there is a wide selection of ownership opportunities. Explore the winter playground with a world class downhill ski area, and groomed cross country trails. Bring the whole family for winter fun while tubing, sledding areas and snow shoeing. Summer is also a great time to visit and experience the majesty of Lake Tahoe as well as world-class tennis, golf, mountain biking, hiking and fly-fishing. This community offers larger residential options including custom homes, homesites & cabins. Each home features dramatic mountain, forest and golf course views. This private, gated golf community has some of the most exclusive amenities in the area including the private Martis Camp Golf Course designed by Tom Fazio. The 50,000 square-foot Camp Lodge that rises above the 18th green and provides members and residents with exquisite dining, locker rooms and spas is one of the current owner’s favorites. Also on the property is the Family Barn complex – this area has a swimming pool, bowling alley, basketball court, and art studio. Lahontan is a private golf course community consisting of custom homes and homesites, each offering privacy and exclusivity to its owners. The community is home of the Championship Golf Course as well as a 9-hole, Par 3 Golf Course, both designed by Tom Weiskopf. Owners can enjoy The Lodge – a restaurant/lounge and full service golf shop, a full spa and fitness center, Camp Lahontan; all-season recreation center with swimming pool, clay tennis courts, sand volleyball, sporting fields, and the Boat House: with fishing docks and a picnic area. This community offers a wide variety of lifestyle options. Ranging from custom homes and homesites to turnkey, maintenance-free, 3 & 4-bedroom Lodge Townhomes. Each of these residential options feature views across Martis Valley from Northstar to the Carson Range. Residents can enjoy the 18-hole Championship Golf Course designed by Johnny Miller & architect John Harbottle III. The golf course has a spacious clubhouse that includes a restaurant and lounge, spa, fitness center, swimming pool, meeting rooms and locker rooms. Schaffer’s Mill is a great option for full-time residents or part-time vacationers. Home of the Jack Nicklaus Signature Old Greenwood Golf Course, rated in 2011 as one of Golf Digest's top 100 public courses, this property is a golfers paradise! A range of lifestyle options are available for full-time residents as well as use as a weekend getaway! Custom homes, large homesites, villas as well as fractional homes area available. Homeowners can choose from dramatic mountain, scenic landscapes or golf course views. Winter amenities and golf access are just the beginning with the neighborhood Pavilion, offering swimming, tennis, fitness, dining and spa facility. Gray’s Crossing has great access to the town of Truckee, CA. One of the quaintest mountain towns in the region. There are custom homes, homesites and townhomes available for ownership. Each of the residential options feature stunning mountain, forest and golf course views. With five distinctive neighborhoods – the area showcases over 6 miles of hiking/biking trails and is home to The Golf Club at Gray's Crossing designed by Peter Jacobson and Jim Hardy. The Club is home to PJ's restaurant, a pro shop, locker rooms, fitness center and pool. 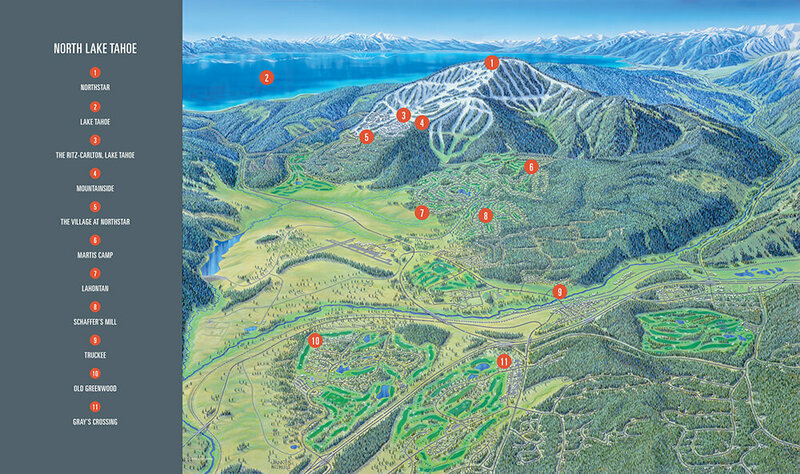 Tahoe Mountain Realty has access to the finest in Lake Tahoe Real Estate. Let our team find you the perfect home throughout some of the most popular communities in the area. Our goal is to provide information that allows the consumers to explore the Lake Tahoe – Truckee area’s numerous luxury resort communities.